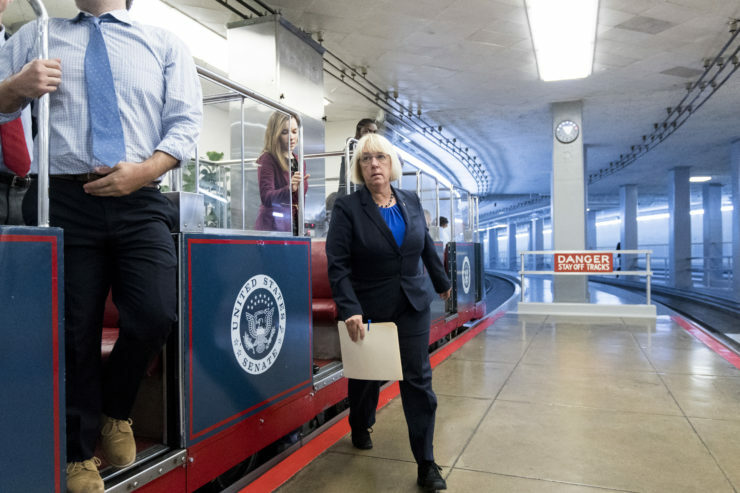 Sen. Patty Murray, D-Wash., arrives in the Capitol via the Senate subway last month. Murray is one of four senators to ask Department of Veterans Affairs Secretary David Shulkin to “immediately suspend” a proposed regulation. Four U.S. senators are demanding the Trump administration scrap a plan to waive a 50-year-old anti-corruption law that prevents officials who administer the GI Bill from accepting money from for-profit schools backed by taxpayer subsidy. In a letter sent late Wednesday, the senators asked Department of Veterans Affairs Secretary David Shulkin to “immediately suspend” a proposed regulation, published in the Federal Register on Sept. 14, that would allow VA employees to receive wages, salary, dividends, profits, gratuities and services from for-profit schools that receive GI Bill funds. The proposed change was exposed by Reveal from The Center for Investigative Reporting, which has repeatedly documented abuses by for-profit colleges who seek to cash in on veterans’ GI Bill education benefits. The New York Times highlighted it as well. The letter was led by Sen. Patty Murray of Washington, the ranking Democrat of the Senate Health, Education, Labor and Pension Committee, and signed by fellow Democrats Elizabeth Warren of Massachusetts, Sherrod Brown of Ohio and Richard Durbin of Illinois. “Many for-profit colleges have been found by numerous law enforcement entities and investigative reporting to have preyed on veterans and service members for access to their educational benefits, and have invested heavily in obtaining special access to military bases and populations,” they wrote. At VA headquarters in Washington, press secretary Curt Cashour said the agency would respond to the senators directly. But critics say the rule change would effectively nullify critical consumer protections. They say it could create a situation where VA officials, who are charged with ensuring GI Bill funds are well spent, could accept payments from colleges that are facing civil suits or probes from enforcement. In their letter, the Democratic senators also questioned whether the Trump administration had the legal authority to grant a blanket waiver allowing government employees to ignore a law passed by Congress and signed by President Lyndon Johnson. Cashour, the VA press secretary, said “there has been no change in implementation plans,” but added that the agency was still accepting comments on the rule change.